International Journal of Research in Health Sciences,2014,2,3,879-883. 1-Asst Professor, Department of Pediatrics. 2-Professor and Head, Department of Pediatrics. 3-Associate professor, Department of radiology. 4-Professor, Department of Pediatrics. 5,6,7,8-Junior resident, Department of Pediatrics, Princess Esra Hospital, Deccan college of Medical sciences, Hyderabad, Andhra Pradesh, India. Background: Holoprosencephaly (HPE) is a rare congenital malformation of the brain, resulting from interrupted forebrain bifurcation. The most common and severe form of HPE is alobar HPE, which is associated with severe facial malformations like cyclopia, ethmocephaly, cebocephaly and premaxillary agenesis. Various syndromic malformations (like trisomy 13,18) can lead to HPE, the most frequent being trisomy 13. Combination of postaxial polydactyly and alobar HPE is seen in trisomy 13. 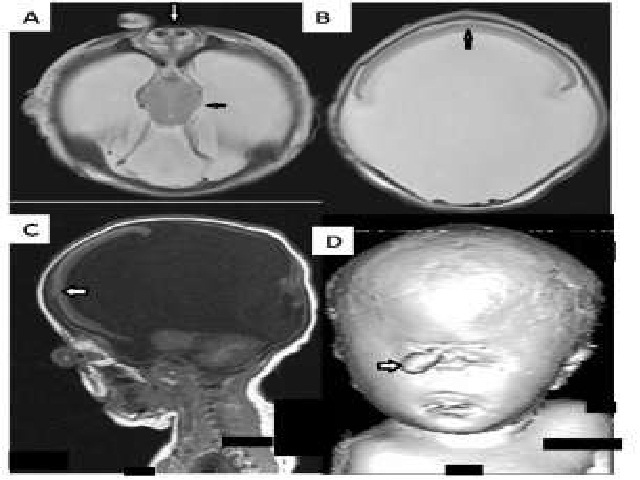 Case report: A 35 weeker male neonate was antenatally diagnosed with alobar holoprosencephaly. Postnatally, this neonate had ethmocephaly with a blind proboscis and post axial polydactyly. MRI brain showed pancake type of thin cortical rim anteriorly, absent corpus callosum and fused thalami with single monoventricle, suggestive of alobar HPE. MRI face was suggestive of ethmocephaly. This rare co-existence of polydactyly and alobar HPE is a hallmark of trisomy 13. As the karyotyping was normal, pseudotrisomy 13 was considered in this case. Conclusion: We report a preterm male neonate with antenatally detected alobar holoprosencephaly and ethmocephaly, which were confirmed by postnatal MRI brain. The rare combination of postaxial polydactyly and alobar holoprosencephaly with normal karyotyping is suggestive of pseudotrisomy 13, a rare entity.